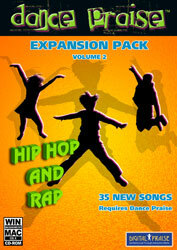 Hip Hop and Rap expansion pack adds 35 new hip hop and rap songs to Dance Praise and Dance Praise 2! With 3 sets of dance steps per track, that's over 100 new dances! Features music from hip hop recording stars, including tobyMac, John Reuben, 4th Avenue Jones', Grits, Verbs, and DJ Maj, as well as tracks from new and emerging artists. Requires Dance Praise and one or two interactive dance pads. When you install it, the new tracks are automatically integrated into your Dance Praise game.